A Medical Consent PDF template is commonly used in the healthcare industry. Disclosure of confidential medical information requires permission from the rightful owner of the information. 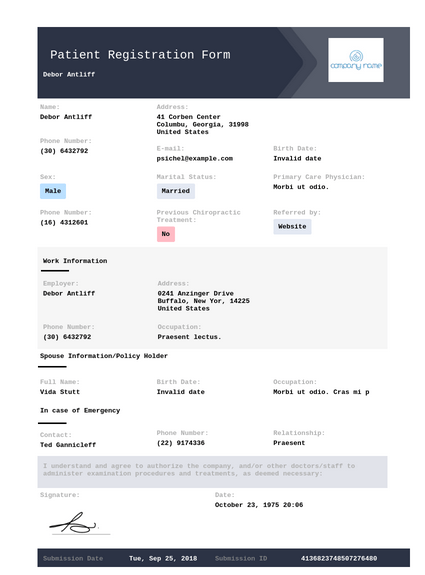 If you need to get authorization for bringing out of medical data from any of your patients, this Medical Consent PDF template is suitable and secure for you. By using this Medical Consent PDF template, you can gather medical data for your patients. This Online Therapy Consent contract sample is a perfect fit for you, if you want to check your patients' crucial data and record their data without any problem. By using this Online Therapy Consent PDF template, you can get online permission from your patients. Moreover, you can print out your consent PDF template for the patient's patient folder. You may collect personal information such as their name, birth date, and contact information. Also, you may inform your patients about their rights with respect to telemedicine with their signature. In addition, you do not have to worry about your data's safety, our forms have HIIPA Compliance. Medical History Record PDF template is mostly used in order to provide significant information about the health history, care requirements, and risk factors of the patient to doctors. It is for collecting data from the patients. Noth­ing on this site is intended to estab­lish a physician-patient rela­tion­ship, to replace the ser­vices of a trained physi­cian or health care pro­fes­sional, or oth­er­wise to be a sub­sti­tute for pro­fes­sional med­ical advice, diag­no­sis, or treatment.